In this new role as Safety Director, Mike will lead and develop Oswald’s safety and risk management culture dedicated to being “best in class.” He will work to implement a zero injury safety program at project sites throughout the company, providing for a safe work environment for all personnel that may visit or work at the job site. 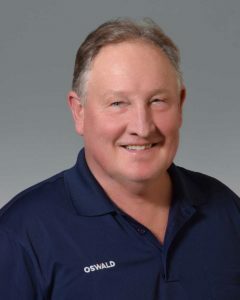 Focusing on planning, implementing, and coordinating safety initiatives to ensure that Oswald safety performance meets or exceeds OSHA, state, and federal requirements, Mike will lead the charge for Oswald to become a recognized leader in both safety and quality. “Mike’s level of expertise, with over 40 years of field experience, positively influences everything he does at Oswald. By pulling from his experience as a tradesman, Superintendent, and Construction Manager, Mike understands the complexity and coordination necessary for success,” states Oswald President, Bob Wassler. Most recently working as a Construction Manager, Mike has proved himself to be skillful and accomplished, even under challenging circumstances. Mike managed the recent new construction of Empower MediaMarketing Headquarters in Over-the-Rhine. Mike and his team delivered a quality project in tight, urban quarter, in addition to maintaining a tight timeline. It’s this sort of experience and dedication that makes Mike Olding a wonderful choice for Safety & Quality Director.